To paraphrase Mark Twain, the death of the solo and small firm practitioner has been greatly exaggerated. At least that’s the case if one is to believe the Attorney Compensation Report released by Martindale-Hubbell today which found that solo and small firm lawyers take home an average of $198,000 in annual income. The Report’s conclusions relied on responses gathered from 6902 attorneys practicing full-time in more than two dozen practice areas. Still, if you drill down into the data, the numbers aren’t necessarily as favorable as they seem at first glance. The report combines data from both solo and small firm lawyers with true solos averaging just $140,000 in earnings to $226,000 by small firm lawyers. Moreover, the median income for both groups comes in at $148,000 – nearly $50k below the average which suggests that income distribution is right-skewed or in other words, that disproportionately higher incomes at the top are propping up the average. Furthermore, a median of $148,000 means that half the lawyers polled earn less than that amount. On the other hand, even under a critical eye, the Martindale-Hubbell results are a far cry from some of the more depressing studies of solo incomes that that issued over the past few years. These include an analysis by one law professors who found, based on an extrapolation of IRS data that solo practitioners earn a dismal $50,000 a year and a more recent Clio Report which determined, based on data of users, that solo and small firm lawyers only billed 2 hours per day which by back of the envelope calculations, would amount to around $78,000/year (assuming $200/hour, 10 hours of billables a year and a 30% discount for non-collection). So what accounts for the discrepancies among these reports? Part of the problem lies with the elusive nature of solos practice itself. Some solos run lifestyle practices – meaning that they earn only as much as they need to support themselves or their family, and devote the rest of their time to other pursuits. 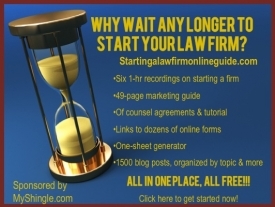 In addition, most lawyers starting out near a year or two to ramp up to full capacity – but data from those early salad years can bring down overall income averages. Finally, there’s so much variation in types of solo practices. Solos with big law experience or running sophisticated IP or regulatory shops serving corporate clients are likely to earn salaries more in line with junior big firm partners than with a solo divorce or disabilities benefits attorneys. The Martindale-Hubbell results may also be more favorable than Clio or IRS data for a second reason: self-reporting error. Surveys rely on participants’ honest responses – yet even under a cloak of anonymity, many lawyers are inclined to inflate or over-estimate their earnings. At the same time, reporting errors cut both ways. We don’t know whether all of Clio’s users accurately account for their time through the system, or whether solos exaggerate business expenses on their tax forms to minimize tax liability. In short, all of the studies carry some built-in margin of error. Yet if that’s the case, why are so many in the legal profession more inclined to believe the sorry portrayal of solo lawyers’ income that emerges from the Clio and IRS surveys rather than the more upbeat story portrayed by the Martindale-Hubbell studies? Two reasons. For starters, by highlighting solos as a bunch of sad sacks, marketers can prey on their desperation and sell them all kinds of pricey systems and coaching services. Second, there are many in the legal profession who are eager to see solos fail. From the biglaw firms that many solos challenge or compete against solos, to the legal futurists who prefer a world where the problems of small folk can all be handled in a generic, “good enough” manner (even if circumstances warrant more) to academics who would rather place newly minted and unemployed JDs in legal ops and e-discovery jobs than teach them to start a law firm, independent-minded and successful solo lawyers pose a threat to these interests’ clients, funding and view of the world. Many of these groups have a vested interest in hastening the demise of solos and one way to do that is to portray solos as impoverished losers so as to deter other lawyers from joining their ranks. We can’t ever forget that many of today’s solo lawyers are struggling to keep their head above water as they compete for clients who no longer need or can afford these services. Yet there are so many others who are thriving. Whether we look at solos as thriving entrepreneurs or endangered dinosaurs depends upon the agenda of the beholder and which data points they choose to believe.